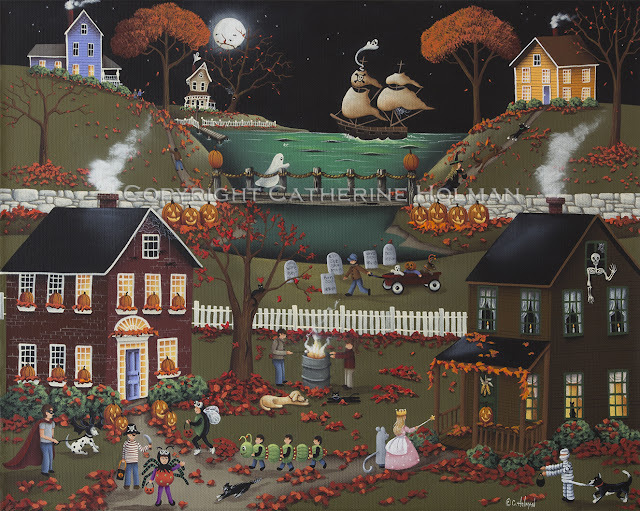 In Pirate's Cove as soon as the moon rises high in the sky, tiny goblins run from house to house giggling and gathering treats of caramel apples, popcorn balls, candy corn and various sweets and surprises. Adults and scared pets warm themselves by an inviting fire as they supervise their surroundings. Pirates anchor their ship in the cove curiously spying on these shenanigans as a ghost slips over the bridge chasing a very tiny witch and her suspicious black cat. This scary evening includes tiny tots and their bewildered dog dressed in strange uncomfortable attire being pulling by the wagon load through a small cemetery. Bugs and various creepy crawlers, pirates, mummies, and a superhero swarm the streets. A sweet princess being escorted by a mouse standing on two feet is about to magically fill her treat bag when she taps on the door, demurely smiles, and chants "trick or treat!" This painting was so much fun to paint! Like I've mentioned before, it's hard to know when to stop painting. I have this painting for sale on my blog and in my Etsy shop. To locate it on my blog, click on the tab at the top for "Original Painting".